Even though "Revenge of the Kobolds" is still in development (Kickstarter launch pending, and due to other financial obligations I can't officially hire my artist yet), I had the strong urge to do something special for Halloween. So I've decided to create an arguably short adventure that could theoretically be run in a single day, using some of the design concepts seen in some Fourthcore products but not necessarily with the same level of difficulty or over the top situations. I wanted something simple and fun that could be played in a single four to five hour session. As seems to be the case in a lot of my products, I'm torn on the name. I wanted to use one of my favorite zone names from Everquest as the title - The Estate of Unrest - but I'm not so sure. The only other name I came up with so far is A Night in Seyvoth Manor, which is kinda cheezy... but that's not exactly a bad thing. With the amount of tropes I'm rolling in to this one, maybe cheezy is the way to go. Few people in the village of Ravenshire spoke of the manor atop the hill to the North, and even fewer dared approach it. 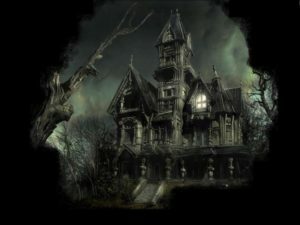 After the horrific events that happened there so many years ago many believe the mansion and the estate grounds to be cursed, haunted by the restless dead, and some of the village residents could swear they have seen movement and lights coming from the seemingly abandoned mansion. Throughout the years the village has had its share of disappearances; most of them had been blamed on the harsh environment of the surrounding forest and the natural dangers of the world we live in, but recent evidence leads to the doorstep of the Seyvoth estate. And when the two young daughters of a prominent noble go missing and the village sends out search parties to the surrounding area, two separate search parties that passed through the iron gate at the entrance to the estate have yet to return. Now a local mystic warns of the danger looming in the manor, how the noble's two daughters will soon be led towards the darkness and turn against the village they once called home. Are you brave enough to step through the gates and seek out the missing search parties and the two noble daughters? Are you willing to unravel the mysteries of the Seyvoth Estate, even if it means risking your own life and sanity? The first version of the adventure is for a party of 6th level characters, using the Dungeons and Dragons 4th Edition rules. I am considering converting it to Pathfinder and other game systems (13th Age, Dragon Age, DCC, etc.) as well, but I'm not sure if I'll have the time to do that before Halloween. There aren't many encounters and the focus is primarily on exploration, so it may not be all that difficult to convert to any number of game systems. It is inspired by the Everquest 2 zone The Estate of Unrest, which has a few Zork-like puzzles ("...find object 'x' to gain access to area 'y'...") and some pretty memorable encounters. As it relates to 4th Edition, I am considering using fixed damage from all monsters and traps simply to expedite the game. 13th Age uses it, I believe, and I've considered trying it out for some time now. We'll see if it works out. I've also gone ahead and written up sanity/insanity rules, loosely based on the rules that exist in the D20 SRD. Problem is that I'm not so sure to what extent I'll be using them... by design, those rules are made for Cthulhu-like horror, which isn't exactly the type of horror I'm going for here. My plans involve classic horror tropes - vampires, skeletons, ghosts, etc. - so it may not have the same level of mental impact that the traditional Lovecraftian horror does. I'll probably be publishing those rules on their own soon, then choose later whether I want to actually use them or not. Whatever this adventure is called, I'm hoping to release it before Halloween. As for Revenge of the Kobolds, we'll see when I can sort my life out in order to get that out the door. Currently waiting on my 6"x9" printed proofs to arrive and for my financials to settle so I can buy art. Stay tuned! I’m really excited to see what you’ve put together!